I sent my car for service in preparation for my trip to Benue since Wednesday. The vehicle was not returned until yesterday evening. I was very angry that the mechanic delayed my planned trip but was also glad that he brought the car back for me to leave this morning. So I decided to drive around to be sure the car was in good condition for the trip, this was about 7.30pm…I drove up to the Games Village Traffic Junction and the car stopped. I tried starting it and it won’t start, so parked, called the mechanic, who told me he has gone home but will see if he can make it back to me. So I decided to start the car once more and Bang! The car burst into flames…I ran out of the car in shock and confusion. The next episode of this mishap is the reason for my narrative. From the moving traffic, I saw men and boys park their cars and were rushing to my burning car with fire extinguishers, some where struggling to open the bonnet. From a building inside games village, I heard women screaming and passing buckets of water, bags of detergents. I saw a guy removed his t-shirt, soaked it in water and was trying to open the bonnet with fire covering his hands. 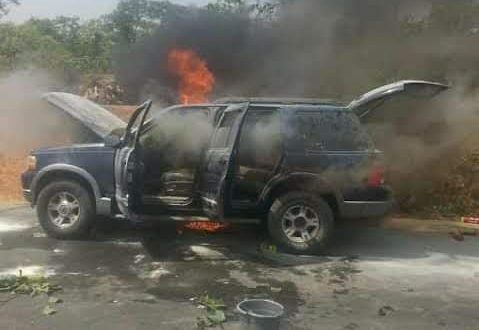 In all this, I was just standing by a tree, with my eyes staring into space, till I saw the flames go out eventually and I heard someone asked…where is the owner of the car? It was then and only then that I stepped forward and found myself being hugged and consoled by strangers, Nigerians, Muslims, Christians, traditionalist and may be atheist. All joined to wish me well and they turned to their cars or homes one after the other. The last being the guy who suffers a deep cut to his leg where he was helping out. As soon as he left, I turned to see what was left of the car and I counted 13 fire extinguishers that were used, other items that were used and also the charred remains of someone’s t-shirt that was used. Just when tears started forming in my eyes, I noticed I was not still alone, there were two policemen who helped to salvage the burning car and have chosen to remain with me till I get family and friends to come take me away. At that moment, my belief that a New Nigeria is possible was renewed and I was proud to be a Nigerian. I woke up this morning thinking, where and how did we get so divided and polarised as a nation, when before my own eyes I saw Musa, Obi, Femi, Andrew, Mike all helping to salvage my car, without caring who I was. I thank God for his mercies and for the good people of Nigeria…together we shall overcome.